Are you Curious? Get a daily workout of lessons, puzzles(including Crossword), and Curios and grow your Curious Quotient (CQ)! Who knew exercising your brain could be this much fun? 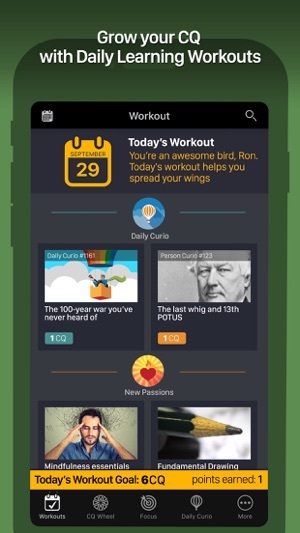 Curious helps people reclaim between 5 to 30 minutes a day to learn something new! - First, we start with a brief interview. 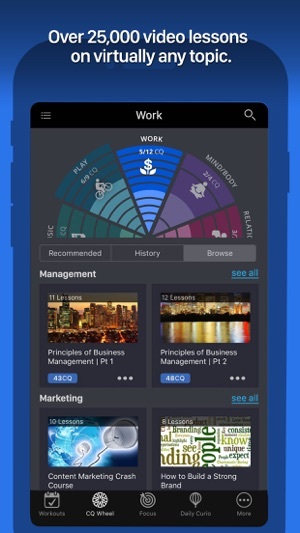 - We customize your learning experience and build you a beautiful CQ wheel. Every wheel is unique! - You receive a daily, personalized learning workout via email and on your Curious dashboard. - You complete your workout by reading Curios (our well-loved daily fun fact), solving puzzles, and watching lessons. - Add lessons and topics to a focus area for longer term learning goals. - Track your progress every time you learn. You’ll be so much more interesting! And you get recommendations from your (and our) favorite NPR shows: Science Friday, PRI's The World, BBC World Service, Marketplace, and more! 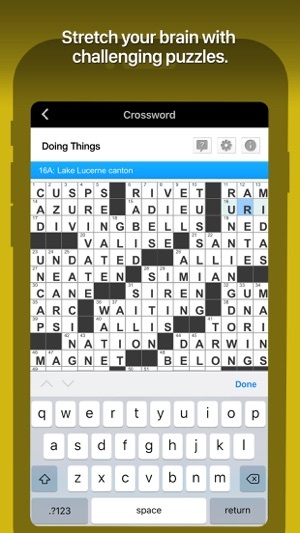 You also get 5 new puzzles every day: classic crossword puzzle, math mayhem with KenKen, and more. 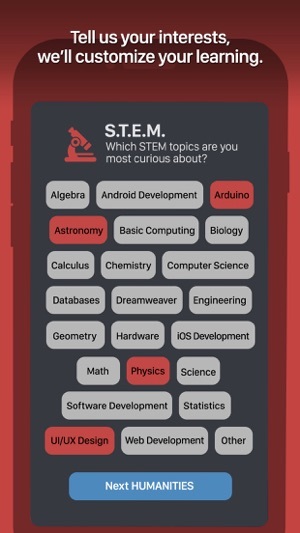 Download the Curious app and start for FREE! Daily Curios and intro lessons available to all users; subscribe for full access to the entire lesson library. FREE trial included with each subscription. What have you got to learn? Get addicted to the game of lifelong learning & stay Curious! Your Curious subscription automatically renews at the end of the subscription term unless auto-renewal is turned off. Subscription renewals cost the same amount as the original subscription, and your credit card will be charged through your iTunes account at confirmation of purchase. You may turn off auto-renewal at any time after purchase by going to your iTunes Account Settings. We love feedback! If you are having fun with Curious, please leave a review. You can also send us feedback directly at support@curious.com! I used this app for a year (forgot to cancel my free trial), and after a year I decided to renew it so I could share it with my dad for Father's Day. My ipad broke shortly thereafter, so I haven't been using it, but my dad has. I just found out that my dad has been using the free version b/c my subscription never renewed, despite having paid for it. Contacted customer service, and they told me I never paid for it, but if I thought I had, I should submit the date I renewed, the name on my credit card, and the last 4 digits of my credit card. I did this, and the next email said that since the charge was made through Apple, I would need to forward a copy of my credit card statement (heck no) or a copy of my email receipt (which I no longer have). Instead, I sent them screenshots of my apple purchases, and a screenshot of the portion of my credit card statement that shows the charge from Apple for that amount on that day. I'm sorry, but if you accept payment through Apple, then figure it out! It shouldn't be my burden to prove to you that I paid for your subscription. Since I sent all the information over yesterday, I have also left a message on Facebook, and I have yet to hear anything via Facebook or email. I would think that a company that charges so much for a subscription would prioritize helping paid customers ASAP. I am now beginning the process of making a complaint with Apple. Hi Sarah, did support resolve this issue or do you need further assistance? I begin each day with Curious, starting with the puzzles then the articles. I’m really good at the. Up & Down but my favorite Is Unilingo. Ken Ken is too simple and boring for me but I still do it and end with the crossword that usually takes about 45 minutes for me to finish. (I’m not real bright) The articles and videos are very enlightening and informative. After I used the free version for about 3 months I decided to buy the full version. I spend more than what I paid for the full version, on junk stuff that I don’t need. I have yet had a chance to use the learning videos but I know I will in time. Every day there is usually something interesting to share with my grandchildren that they may not learn in school. For me, Curious is a good entertainment investment and it gets two thumbs up. So far it seems like a worthwhile investment. I’ve only just started to use it regularly after having it for a month and have just been figuring out its uses. The games are somewhat challenging. I enjoy the positive talks and find them inspiring while also showing me I could make my own. After two days I have learned how to sign the alphabet and that is something I have been talking about doing for 6 months. I will be diving deeper into this app while continuing to practice the features I have found already. I do find it expensive, but if you think about how ridiculously priced private college is this is a cheap way to learn skills that can pad your resume and make you stand out amongst other candidates.